The available options are significantly more expensive than the much touted $35,000 price tag. Electrek is reporting that Tesla is preparing to begin fulfilling their Model 3 orders. Right now, employees who have priority reservations are being given access to an online configurator to help build their cars to a host of specifications. One of the Model 3’s biggest selling points is its low price tag, relative to other electric vehicle options. However, the available specs on this round of shipments require customers to drop at least $48,000, a far cry from the starting price of the $35,000 base vehicle. This added cost covers the longer range battery, which can take the vehicle 499 km (310 miles) versus 354 km (220 miles) for $9,000. 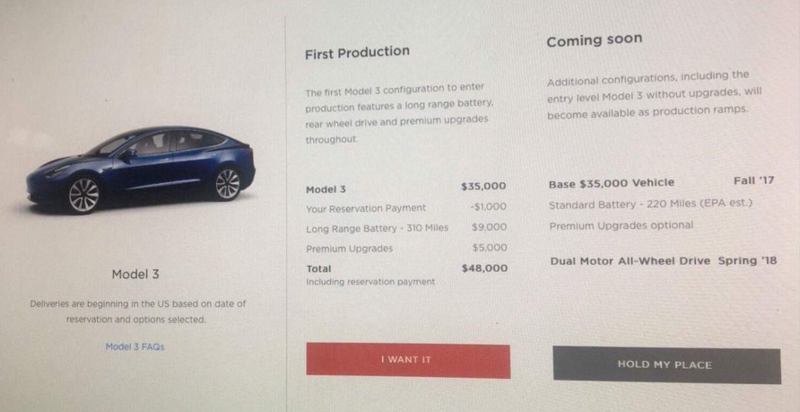 Other “Premium Upgrades” include a glass roof which accounts for the remaining $5,000. There is another option to wait for the cheaper features to be available if a customer decides thrift is more important than expedience. The design studio allows users to choose from 6 colors and two wheel options, among the aforementioned options.Musk has previously mentioned that he foresees 150 deliveries next month, so it may still be a while before the general public gains access to the configurator, let alone get a chance to drive their creation. Tesla’s factories are revving up to greatly increase the production of the vehicles. The current goal, according to Electrek, is 5,000 units per week in December.